High speed Metal button Stamping Press Machine use integrated special cast iron alloys with high rigidity and shock resistance. The slider is designed with a long guide and equipped with a slider balancing device to ensure precise and stable operation. All anti-wear components are electronically timed automatic lubrication systems, such as the lack of lubricant, the punch will be fully automatic stop. Advanced and simple control system ensures the accuracy of the running and stopping of the slider. It can be used with any automated production requirements to increase production efficiency and reduce costs. The design principle of the high speed press is to convert the circular motion to linear motion. The main motor is used to drive the flywheel and the clutch drives the gear, crankshaft (or eccentric gear), connecting rod, etc. To achieve the linear movement of the slider from the main motor to the movement of the connecting rod is a circular motion. There must be circular and linear movement between the connecting rod and the slider. There are roughly two types of mechanism in the design, one is a ball type, and the other is a pin type (cylindrical type). Through this mechanism, the circular motion Converts the linear motion of the slider. Presses apply pressure on the material to plastically deform it to obtain the required shape and precision. Therefore, it is necessary to cooperate with a set of dies (separate upper and lower dies) to place the material between them and apply pressure to the machine to deform it. The reaction force caused by the force exerted on the material during processing is absorbed by the punch machine body. The high-precision punch not only produces a good product, but also has less damage to the mold, which not only saves the maintenance time of the mold, but also saves the maintenance cost. This High Speed Press Machine is used to make all kinds of metal buttons, such as jean buttons, zipper puller, snap fasteners, rivets, cap , cap shank, hook and so on. This High speed press machine is used to make all kinds of eyelet, such as shoe's eyelet, curtion eyelet and so on. This high speed press machine is used to make all kinds of terminal and saw blade. Stept-1: Electrical falt Uncoiler FU-1000, Loading coil and uncoilling coil. 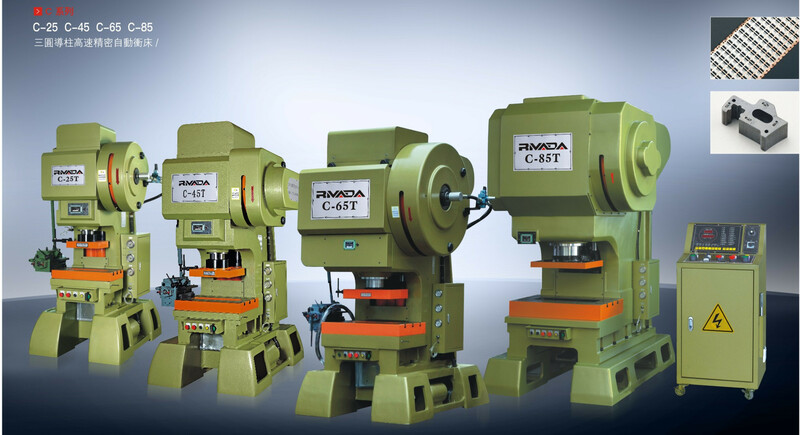 Stept-2: High Speed Roller Feeder machine:,Model:RF-105NS, Feed coil to press machine. Stept-3: High speed press machine RC-25T with tools, pressing to the end product. What's more, we add the water tank, it can protect the mould . The function of water tank is cooling the mould and reduce the wastage of the mould. Our high speed press machine equiped the dynamic balancing device, it can make the machine steady when it works and prolong the service life of equipment. 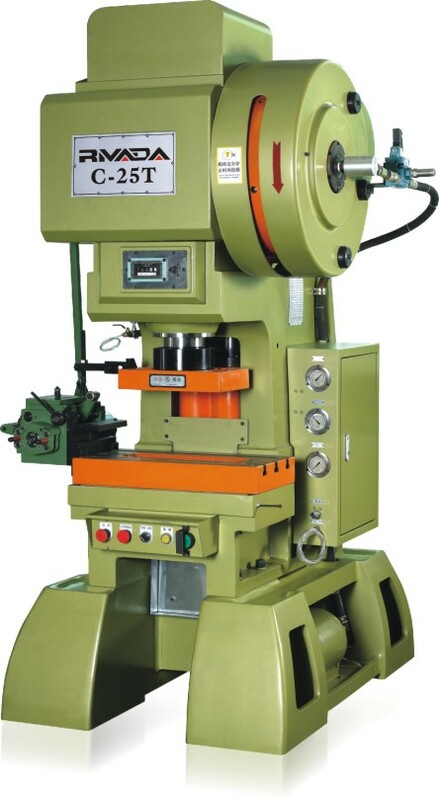 Looking for ideal C Type High Speed Press Machine Manufacturer & supplier ? We have a wide selection at great prices to help you get creative. All the High Precision Press Machine are quality guaranteed. 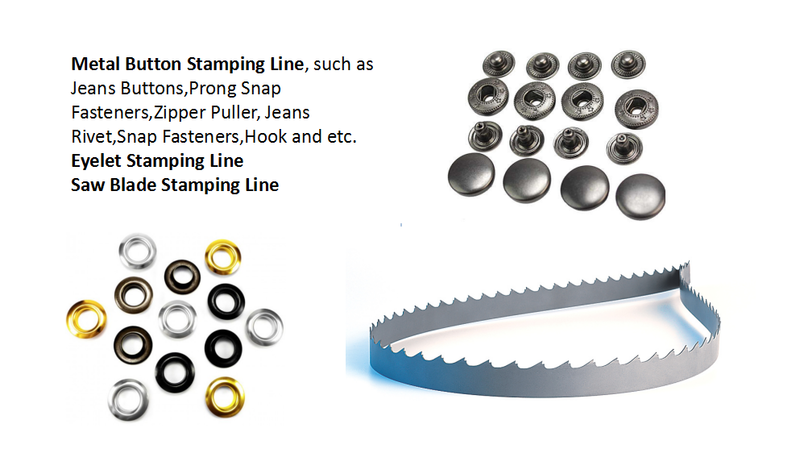 We are China Origin Factory of Metal Button Stamping Line. If you have any question, please feel free to contact us.